I have never read any of Cassandra Clare's bestselling book series that began presumably with The Mortal Instruments: City Of Bones although there is a prequel series entitled The Infernal Devices available too. Ever since the combined box office successes of the Harry Potter films, Lord Of The Rings and others, Hollywood has been developing novels of all genres and targeted at audiences of all ages searching for that next Twilight Saga or next Hunger Games, both of which feature female lead protagonists. So it is no surprise that the feature film adaptation of The Mortal Instruments: City Of Bones, which features a young teenage female protagonist and a dark fantasy world hidden within the streets of New York City would be adopted for the big screen. In a nutshell the film follows Clary Fray (Lily Collins), who begins to see strange supernatural beings that no one else can. Then after witnessing a demon slaying in a club she returns home to find her mother missing and another demon waiting for her. Fortunately she is saved by one of the demon slayers she saw the night before and then goes on a quest where she discovers that she too is destined to become a protector of humanity and slayer of demons otherwise known as a Shadow Hunter. Her quest involves locating a sacred cup that once held the blood of an Angel that created the order a thousand years earlier for aside from being a descendant of a Shadow Hunter, the only way new members can be initiated is to locate the cup so they can drink from it. The cast includes Lena Headley, Jamie Campbell Bower and Jonathan Rhys Meyers. The film is entertaining though it has a generic quality to it that will call to mind other movies and TV shows that have come before it, regardless of the genre and some of the monsters look like CGI variations of creatures from the Resident Evil and Silent Hill films, which were also produced by Sony Pictures. There are signs of a rich mythology, but most of it feels like a variation on embroidery done better elsewhere. If you want to just take it at face value as a fun dark fantasy romp aimed at pre-teenage girls and not too finicky comic book readers, The Mortal Instruments: City Of Bones is very watchable. Sony Pictures Home Entertainment delivers a solid Blu-ray Disc and DVD combo pack complete with a redeemable code for a limited time on an insert within the two-disc BD case for an Ultraviolet HD digital copy that can be downloaded and or streamed on to a variety of mobile devices. The picture quality on the Blu-ray seems spot on with a flawless 1080p/24fps presentation for both the feature film, which is presented in widescreen (2.40:1) aspect ratio with English DTS-HD MA 5.1 Surround Sound too. All of the bonus features on the disc are also presented in full HD resolution. An English Descriptive Audio Track and English Subtitles for the Deaf and Hearing Impaired are encoded as options along with standard English And Spanish Language Subtitles. A standard definition copy of the film on DVD is also included with an anamorphic widescreen presentation and Dolby Digital 5.1 Surround Sound and similar features encoded too. The interactive menus on both discs are well rendered and easy to navigate. Both the Blu-ray Disc and DVD include six deleted scenes that can be viewed individually or via a Play All option (4:44) and a music video (3:44). Featurettes on how the cast and filmmakers brought characters to life and the fighting choreography for the action sequences are also included. However if you watch the Blu-ray Disc version then you will also have access to additional featurettes covering how elements from the book were developed for the screen, including the Shadow World and more intense discussion of the characters. All of these featurettes on the Blu-ray Disc can be watched individually or collectively (29:05). The best Blu-ray exclusive is the interactive character lineage tracker, which features narration for the various factions, species and affiliations in the film along with character specific on screen notes and short companion photo galleries. Previews that include a Blu-ray Disc spot and trailers for One Direction: This Is Us, After Earth, Austenland, Battle Of The Year and Insidious Chapter 2 wrap up the bonus materials on the Blu-ray Disc. 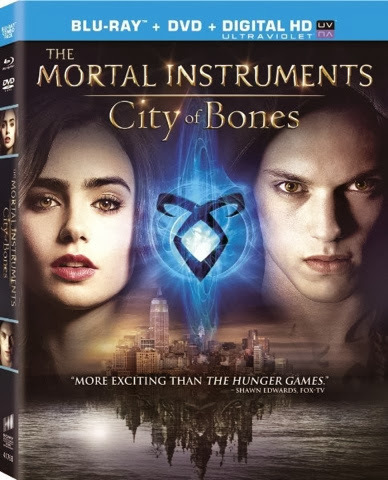 The Mortal Instruments: City Of Bones Blu-ray + DVD + Digital Copy HD Ultraviolet will debut at retailers on and offline on Tuesday, December 3, 2013 courtesy of Sony Pictures Home Entertainment.